Are you programming with Microsoft QuickBasic, Rapid-Q or any other language in Basic? Then enter in The QB World! This awesome site entirely dedicated to software programming in Basic is very complete, and offers a lot of downloads: information, tutorials, libraries, tips and tricks, FAQs, and much more. And it's without counting the huge number of QBasic games and applications available for download! 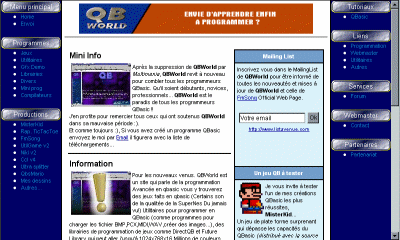 Very nice, for the most expert QBasic programmers as well as beginners. It has been done by one of my friends, Achraf Cherti, and survived to its deletion from MultiMania to comeback with a very nice and new PHP interface. So, go! Here is the state-of-the-art of the internet websites about Delphi programming. Everything is here: components, source codes, resources, online shop, applications, tools, examples, documentation, information and book review, a newsletter, some links, and much more. A search engine is also present, to find exactly what you are searching for, with useful ads directly related to Delphi. The whole contents being available with a very nice design. A must.